If you are looking for a glam hairstyle, I’d recommend going with a crystal headpiece or hair comb. If you are going for a boho aesthetic, try a flower crown, flowers, or a hair vine with flowers or crystals to add some sparkle. Sometimes it can feel overwhelming with so many options. I get it; I’ve been there. And honestly - sometimes less is more. If you are wearing a messy side bun, you could try scattered crystal hair pins to incorporate a huge impact. The styling potential is endless! 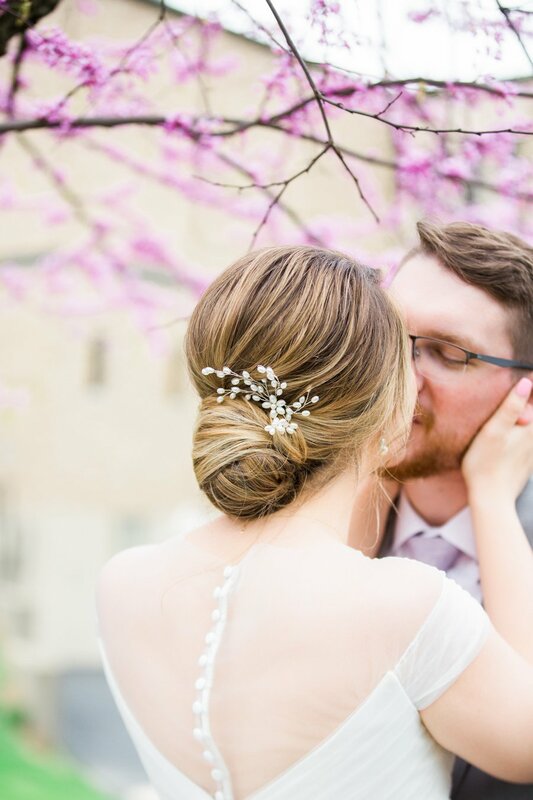 You know those gorgeous hair photos you keep pinning on wedding Pinterest board? I do, because I did that all of the time. I always gravitated towards the photos of hair with accessories. When I looked them up, the ones I wanted were so expensive. And that's why I want to share this information with you; I am here to help. If I do a side swept hairstyle and hairpiece, where should I place the veil? What kind of veil should I get? If you have really fine hair, heavier headpieces will be harder to hide the pins and might weigh your style down. The best pieces in my opinion for fine hair would be a thin vine, medium/ small comb or a few crystal pins. If you have thick coarse hair, depending on style, you can opt for a heavier piece. If you are wearing a crown, please consult with your hairstylist prior to buying to make sure it fits your head properly. I recommend a few crown-like pieces to be arranged instead of a full, dramatic crown. This not only makes styling easier and more efficient, but more stable too. In most cases, we secure all of the hair accessories with additional bobby pins. The best time to try out different hair pieces is during the trial run once we know the texture of your hair and your ideal hair style. As we've discussed before, sometimes your dream hair style isn't practical. For the bride without a budget: We’ve all been at the bridal shop where we find the dress, and in this ah-ha moment the consultant throws on the veil and $600-800 hairpiece. DON’T buy that headpiece right away. We know you love it, but seriously - shop around. There are so many options out there! We work with accessory line Kata Banko Couture; and she is incredible. She can make custom pieces for half the cost, and the plus side, she makes everything by hand using recycled metal stampings, crystal sands, Swarovski elements and signature components. We can also provide a selection of pieces for you at your trial so you may select the perfect accessory and see it bring your bridal hair style together. And if you do find something you love, my promo code Caralee will get you 10% off your order! Bottom line: Accessories in hair look and translate beautifully in photos. We're ready to help you choose not only the perfect style, but the right accents to complement the look. Getting married? Let's chat!